Heat 5-quart Dutch oven over medium-high heat; add sausage. Cook 5 to 6 minutes, stirring to break up pieces, until no longer pink. Drain, and reserve. Add oil to Dutch oven; heat over medium heat. Add onion, carrots, celery and green beans. Cook 4 to 5 minutes, stirring occasionally, until vegetables are just crisp-tender. Stir in zucchini, garlic and thyme; cook about 1 minute or until garlic is fragrant. Stir in tomatoes, broth, cannellini beans and sausage; heat to simmering. Cover; reduce heat to medium-low. Simmer 18 to 20 minutes or until vegetables are tender but not soft. Stir in basil; serve with Parmesan cheese. Your crowd not interested in spicy soup? Regular Italian sausage can be substituted for the spicy sausage in this recipe. This soup can be frozen for up to 6 months. If you plan to freeze, omit the basil. Completely thaw in refrigerator; reheat to a full simmer, and add fresh basil after reheating. A perfect meal for cold weather days, this comforting Italian sausage soup is both hearty and filling. Great for family dinners, soups make easy work of meal prep; simply throw everything together and let it simmer. You can even make it ahead of time and freeze some for later. Plus, this sausage vegetable soup can easily be customized to fit your family’s tastes. If you prefer a milder soup, simply replace the spicy sausage with regular Italian sausage. And rather than green beans and zucchini, you can add in other vegetables like kale, spinach and mushrooms. While this soup is a meal in itself, it rounds out dinner when you serve with crusty bread for dipping and a fresh side salad. 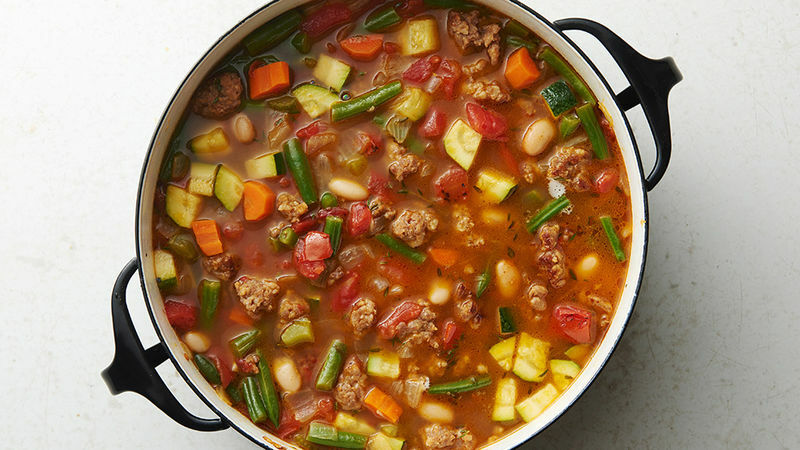 So the next time you need a quick pick-me-up meal, try this Italian sausage and vegetable soup, or another one of our soups for when you want something heart-warming and rib-sticking.